Warmer winter days call for over-the-knee socks, tall boots, and a skater skirt! So I took advantage of the warmer weather for a photoshoot with this look. In my recent post Ripped Denim + Sequins, I stated that I participated in the buy one, get one free sale at Forever 21, well my free item was the red/navy blouse featured here! I love this blouse and all its intricate details such as the gold ball shaped buttons and the ruffles. 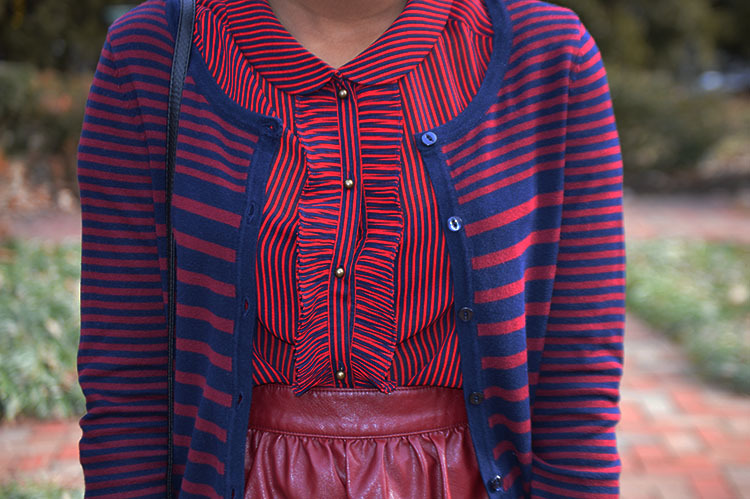 Mixing vertical and horizontal stripes always makes for a fun look, and pairing both the burgundy/navy cardigan and red/navy blouse proves it. I’m happy that I finally had the opportunity to wear my tall boots on the blog from Nordstrom Rack that I listed in my “The Perfect Black Boot” post. I told you I would feature them in a look! 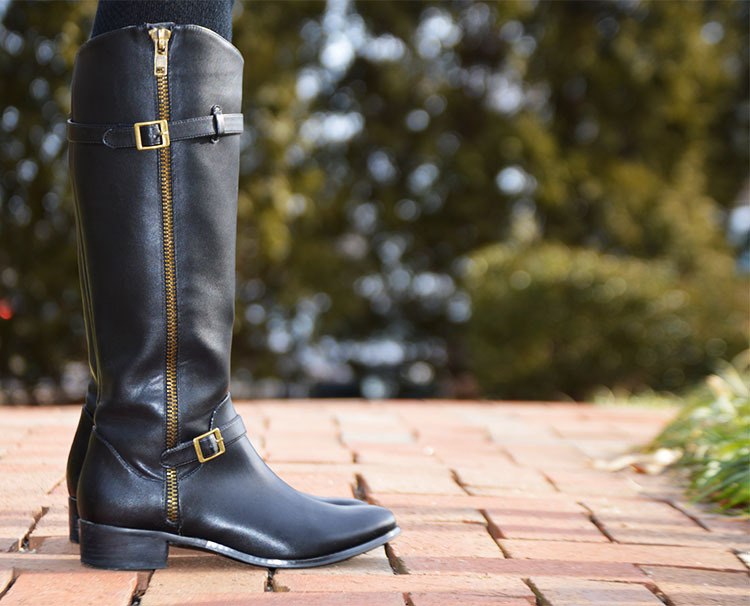 I can’t express enough how much I love these boots for their versatility and comfort! Not only do they look great with my jeans but they look great with the burgundy Faux Leather Mini Skirt I purchased from Forever 21 some months ago. If you follow me on Instagram you might of seen me feature it in an outfit of the day/night look (See it here, and let me know which look you like best!). It’s a perfect piece in your closet whether you want to dress it up or down, and the Under Lock and Key Satchel from Nasty Gal is its perfect companion. This satchel just continues to melt my heart when I see it, it oozes adorableness! Overall, this look is girly and fun! If you’re doing something casual on Valentine’s Day this can be the perfect look! Very chic outfit. Love your boots. I am ALL ABOUT the faux leather lately! Thank you! Yes I can’t get enough of it either! Adorable outfit! Love the boots. I need some like that in my life. Thank you! Yes these are by far my favorite in my closet! Love this skirt!! Its so so nice. Great look dear.